OpenNebula 4.4 RC (4.3.90) is Out For Testing! Nov 22h, 2013. After the release and evaluation of the second beta of OpenNebula 4.4 (4.3.85) Retina, the OpenNebula project announces the immediate availability of the release candidate of OpenNebula 4.4 Retina. Several improvements have been made to the cloud bursting model, including better scheduler support, better storage management (ie, prolog and epilog bypassing when cloud bursting) and improved AWS EC2 functionality support (broader monitoring, drop CLI for Ruby SDK, etc). https://opennebula.org/wp-content/uploads/2018/11/opennebula_cloud_logo_white_bg-4.png 0 0 Tino Vazquez https://opennebula.org/wp-content/uploads/2018/11/opennebula_cloud_logo_white_bg-4.png Tino Vazquez2013-11-22 16:07:452013-11-22 16:11:46OpenNebula 4.4 RC (4.3.90) is Out For Testing! This is the third entry in a blog post series explaining how to make the most out of your OpenNebula 4.4 cloud. In previous posts we explained the enhanced cloud bursting to Amazon features and the multiple groups functionality. OpenNebula supports different storage backends. You can even create VMs that use disks from several backend technologies at the same time, e.g. Ceph and LVM. The system datastore is a special Datastore class that holds disks and configuration files for running VMs, instead of Images. Up to OpenNebula 4.2, each Host could only use one system datastore, but now for OpenNebula 4.4 we have added support for multiple system datastores. Maybe the most immediate advantage of this feature is that if your system datastore is running out of space, you can add a second backend and start deploying new VMs in there. But the scheduler also knows about the available system datastores, and that opens up more interesting use cases. SCHED_DS_REQUIREMENTES = "NAME = ssd_system"
What about the load balancing mention in the title? Instead of different storage backends, you may want to install several similar system datastores, and distribute your VMs across them. This is configured in the sched.conf file, using the ‘striping’ policy. Looking for an old school system DS. There must be like 20 MB combined here. We hope you find these improvements useful. Let us know what you think in the mailing lists! As you may know, OpenNebula’s approach to cloud bursting (that is, its hybrid cloud model) is quite unique. The reason behind this uniqueness is the transparency to both end users and cloud administrators to use and maintain the cloud bursting functionality. The transparency to cloud administrators comes from the fact that a an AWS EC2 region is modelled as any other host (albeit of potentially a much bigger capacity), so the scheduler can place VMs in EC2 as it will do in any other local host. Of course, the scheduler algorithm can be tuned so the EC2 host (or hosts, more on this below) is picked last, so it will be only used only if there is a real need (ie, the local infrastructure cannot cope with the demand). 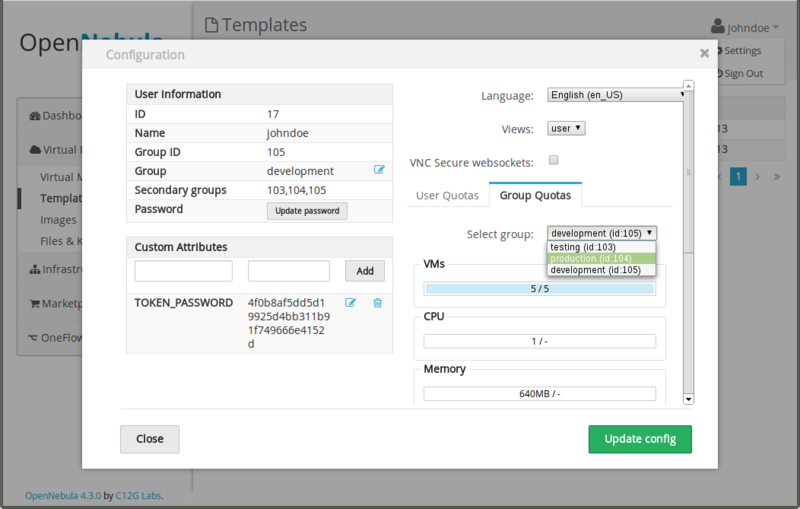 On the other hand, the transparency to end users is offered through the hybrid template functionality: the same VM template in OpenNebula can describe the VM if it is deployed locally and also if it gets deployed in Amazon EC2. So users just have to instantiate the template, and OpenNebula will transparently chose if that is executed locally or remotely. Very convenient, isn’t it? In the new OpenNebula 4.4 (beta 2 version has just been released), these drivers have been vastly improved. For starters, the underlying technology has been shifted from using Amazon API Tools, which basically spawned a Java process per operation, to the new AWS SDK for Ruby. This means a much better improvement and resource usage in the front-end. Moreover, it is possible now to define various EC2 hosts to allow OpenNebula the managing of different EC2 regions and also the use of different EC2 accounts for cloud bursting. 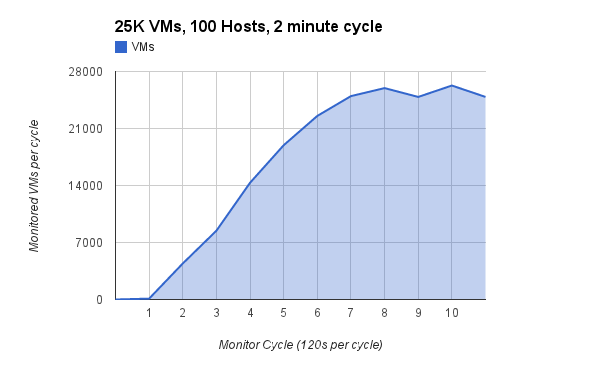 In this new model, these different hosts can model the same region, but with different capacities. Functionality is also richer in the EC2 drivers in OpenNebula 4.4. There is support to define EBS optimized VMs, to define VM tagging, etc. It is also important to highlight the improvement made in monitoring, with a whole new set of information retrieved from the Amazon EC2 VM instances (see Hybrid Cloud/Cloudbursting section in Compatibility guide). For instance, these improvements makes possible to support Amazon EC2 VMs in Virtual Private Cloud (VPC). There has been also huge improvements regarding monitoring performance, with information from all the VMs gathered in the same call. There is still a chance to influence the final OpenNebula 4.4 release. If you have any comments on this, please let us know through the mailing list. We want to thank the awesome feedback received from the community, as well as patches provided by users running OpenNebula in large scale deployments, using an active cloud bursting model. OpenNebula 4.4 Beta 2 Is Out For Testing! Nov 18th, 2013. Thanks to the terrific feedback obtained from the release of OpenNebula 4.4 Beta (4.3.80) Retina, the OpenNebula project announces the immediate availability of the second beta of OpenNebula 4.4 Retina. This beta version comes with a number of bugfixes and feature enhancements (check the release notes for more information). We would like to highlight the differences from the first beta that motivated this release. First of all, improvements in the Ceph storage drivers, that now allows the use of these drivers in all the supported platforms. We would appreciate any feedback that we can get with this bug fix. It is also worth noting the name change of the LVM filesystem drivers, from shared_lvm to fs_lvm. Please note that, in order to update the new drivers in the virtualization hosts, the administrator has to perform a onehost sync operation in the front-end. https://opennebula.org/wp-content/uploads/2018/11/opennebula_cloud_logo_white_bg-4.png 0 0 Tino Vazquez https://opennebula.org/wp-content/uploads/2018/11/opennebula_cloud_logo_white_bg-4.png Tino Vazquez2013-11-18 16:24:042013-11-18 16:24:04OpenNebula 4.4 Beta 2 Is Out For Testing! Cache your storage on a local SSD, but hold your working copy on a remote server, or indeed servers. Using such a mechanism, we’ve managed to eradicate all of the negatives we experienced historically other options. If you assume a 90% hitrate, then 90% of your requests will be subject to a latency of 0.1ms (SSD) rather then 10ms (HD) , so the responsiveness of instances running on cache when compared (for example) to NFS is fairly staggering. If you take a VM running Ubuntu Server 12.04 for example and type “shutdown -r now”, and time hitting the return key to when it comes back with a login prompt, my test kit takes under 4 seconds – as opposed to 30-60 seconds on traditional NFS based kit. And when it comes to cost, this software has been designed to run on commodity hardware, that means desktop motherboards / SSD’s on 1G NIC’s – although I’m sure it’ll be more than happy to see server hardware should anyone feels that way inclined. OpenNebula Celebrates its 6 Year Anniversary! Time flies, and we are once again celebrating our anniversary. 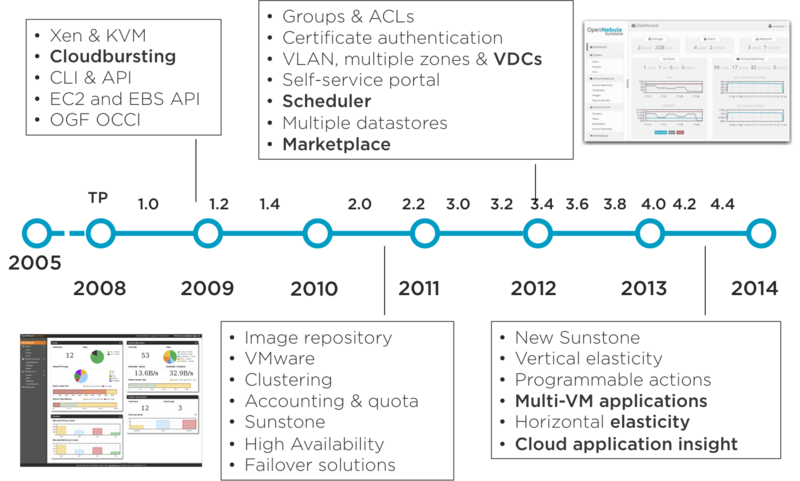 Let me take advantage of this opportunity to describe the progress of the project during the last 6 years by using the slides of the opening talk “Unleashing the Future of Open-source Enterprise Cloud Computing” in the first OpenNebula Conference held in Berlin one month ago. OpenNebula started as a research project more than 8 years ago, in November 2007 we created the OpenNebula open-source project. Since then OpenNebula has evolved from a research project into an enterprise-ready product matured through many release cycles. OpenNebula was originally funded by the European Commission in the context of flagship projects in cloud computing research and innovation, and it is now mainly sustained by C12G Labs thanks to customer support subscriptions and Fund a Feature projects. We are extremely happy with the organic growth of the project. Many people and organizations contribute in different ways, from the expertise and dedication of our core committers and hundreds of contributors to the valuable feedback of our thousands of users. Most of our contributors are users of the software that are willing to contribute new innovative features from their production environments, not developers hired by vendors to contribute to the project. OpenNebula is really vendor-neutral, there is no hype, just a focus on real-life needs, developing the best technology, and serving our users. 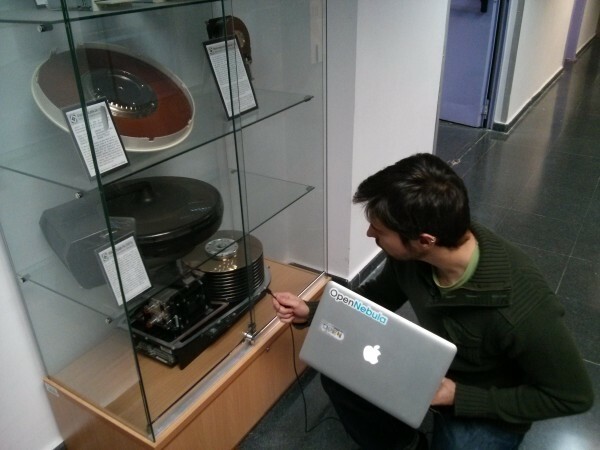 Next year’s OpenNebula Conference will be held in Berlin as well, 2-4 of December, 2014. If you want to repeat or find out how it is for yourself, save the date!. The number of downloads from our repositories is doubling each year. There are tens of thousands of deployments around the globe and OpenNebula is parked in some of the biggest organizations out there including Industry and Research leaders building enterprise private clouds, cloud services, and clouds for HPC and Science. We have recently collected some user stories in our web site. OpenNebula has released 18 stable versions in a rapid release cycle to accelerate the transfer of innovation to the market. We leverage the power of user-driven development. OpenNebula’s roadmap is completely driven by users needs with features that meet real demands, not features that result from an agreement between IT vendors planning to create their own proprietary cloud solution. An active and engaged community, along with our focus on solving real user needs in innovative ways and the involvement of the users in a really vendor-agnostic project, constitute the OpenNebula’s recipe to success. We continue to focus on making sure OpenNebula continues to be the most solid, powerful and flexible open-source management platform to build and manage Enterprise Clouds. If you haven’t had a chance yet, please check out all of the new features of OpenNebula 4.4. The stable version will be out in few days. Let me end the post with one of my favourite quotes. Thanks to all of you and happy anniversary! https://opennebula.org/wp-content/uploads/2018/11/opennebula_cloud_logo_white_bg-4.png 0 0 Ignacio M. Llorente https://opennebula.org/wp-content/uploads/2018/11/opennebula_cloud_logo_white_bg-4.png Ignacio M. Llorente2013-11-13 23:40:392014-02-19 10:55:38OpenNebula Celebrates its 6 Year Anniversary! OpenNebula 4.4 Beta Is Out For Testing! Nov 7th, 2013. You are surely aware of the new features introduced in OpenNebula 4.2 Flame, and its focus to strengthen the most demanded and useful features. So now is time to move forward and implement new features demanded by our uses and that’s why the beta version OpenNebula 4.4 Retina is out for testing! This release includes important features that meet real demands from production environments, with a focus on optimization of storage, monitoring, cloud bursting, and public cloud interfaces. OpenNebula Retina includes support for multiple system datastores, which enables a much more efficient usage of the storage resources for running Virtual Machines. This feature ships with different scheduling policies for storage load balancing, intended to instruct OpenNebula to spread the running Virtual Machines across different storage mediums to optimize their use. This translates in the ability to define more than one disk (or other backend) to hold running VMs in a particular cluster. 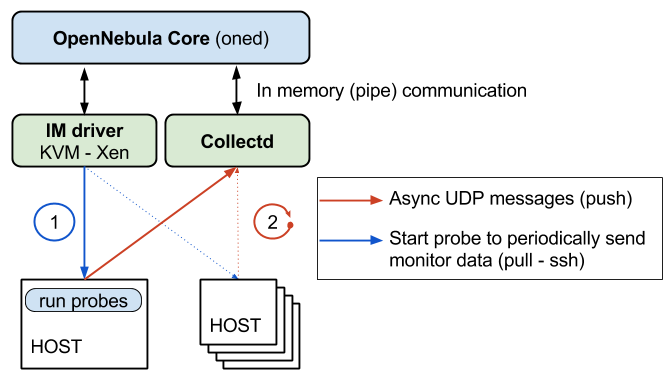 Monitorization subsystem in OpenNebula underwent a major redesign as well, effectively switching from a pulling mechanism to a pushing model, with the implications in scalability improvements. https://opennebula.org/wp-content/uploads/2018/11/opennebula_cloud_logo_white_bg-4.png 0 0 Tino Vazquez https://opennebula.org/wp-content/uploads/2018/11/opennebula_cloud_logo_white_bg-4.png Tino Vazquez2013-11-08 13:35:172013-11-08 13:35:17OpenNebula 4.4 Beta Is Out For Testing! OpenNebula 4.4 is in the oven, and the fumes of the beta can be already seen in the approaching horizon. A myriad of new features, bug fixes and general improvements are underway! In the realm of cool features, we would like to highlight support for multiple system datastores, improved Open vSwitch integration, better xmlrpc concurrency, support for IP reservations and many other nice improvements. Monitorization is also being severely revisited, with an agent based approach that will turn the monitoring philosophy in OpenNebula from pulling to pushing (yay!). Moreover, driver enhancements are also underway like for instance, improved EC2 support. Expect lots of new enhancements to the unique OpenNebula hybrid cloud model: switching to Ruby SDK instead of Java API tools, more robust and effective monitoring, etc. Also, support of EC2 API in OpenNebula to build public clouds will be greatly improved: snapshotting, tags and improved describes. One of the most useful (and most difficult to implement, at the same time) features would be multiple group functionality, with an approach mimicking that of unix groups. Please check this blog post to get a peek on the upcoming feature. Check the development portal for the full set of features and bugs to be dealt with for OpenNebula 4.4. Also, to guarantee our commitment for previous versions support, a new version of the OpenNebula 3.8 series (Service Pack 2, 3.8.5) has been released, bringing even more stability to the 3 series. Awesome speakers render awesome talks, like the ones held at the OpenNebulaConf 2013 last month in Berlin. If you want to remember the great ambience of the conference, or if you haven’t got a chance to attend, here is your opportunity to (re)visit the knowledge shared in the conference in the form of recordings of the keynotes and talks. Also, you can check out the presentations of the speakers if you want to consult a particular detail that you do not quite remember. And, to make the experience even more immersive, scout through the conference pictures. 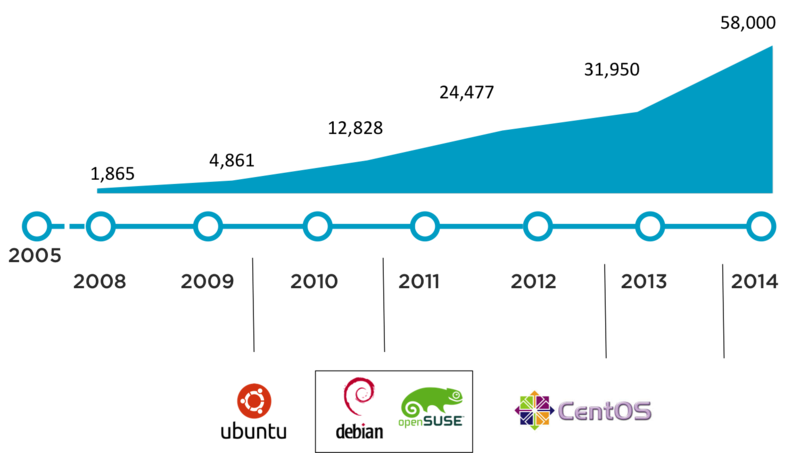 A very interesting event to be held this month is the C12G organized CentOS dojo. This November 8th, in Madrid, Spain, a very good array of speakers (including CentOS director and OpenNebula developers) will shed light on OpenNebula, clouds and CentOS, at the C12G Labs HQs, following an OpenNebula tutorial given the previous November 7th.